If you are considering towing with your vehicle, you should first check with your country's Department of Motor Vehicles to determine their legal requirements. Since laws vary the requirements for towing trailers, cars, or other types of vehicles or apparatus may differ. Ask an authorized KIA dealer for further details before towing. WARNING - Towing a trailer If you don't use the correct equipment and/or drive improperly, you can lose control when you pull a trailer. For example, if the trailer is too heavy, the brakes may not work well - or even at all. You and your passengers could be seriously or fatally injured. Pull a trailer only if you have followed all the steps in this section. WARNING - Weight limits Before towing, make sure the total trailer weight, GCW (gross combination weight), GVW (gross vehicle weight), GAW (gross axle weight) and trailer tongue load are all within the limits. Pulling a trailer improperly can damage your vehicle and result in costly repairs not covered by your warranty. To pull a trailer correctly, follow the advice in this section. Your vehicle can tow a trailer. 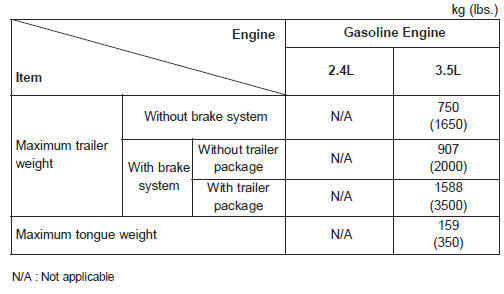 To identify what the vehicle trailering capacity is for your vehicle, you should read the information in “Weight of the trailer” that appears later in this section. Remember that trailering is different than just driving your vehicle by itself. Trailering means changes in handling, durability, and fuel economy. Successful, safe trailering requires correct equipment, and it has to be used properly. This section contains many time-tested, important trailering tips and safety rules. Many of these are important for your safety and that of your passengers. Please read this section carefully before you pull a trailer. Load-pulling components such as the engine, transaxle, wheel assemblies, and tires are forced to work harder against the load of the added weight. The engine is required to operate at relatively higher speeds and under greater loads. This additional burden generates extra heat. The trailer also adds considerably to wind resistance, increasing the pulling requirements. It's important to have the correct hitch equipment. Crosswinds, large trucks going by, and rough roads are a few reasons why you’ll need the right hitch. Here are some rules to follow: • Will you have to make any holes in the body of your vehicle when you install a trailer hitch? If you do, then be sure to seal the holes later when you remove the hitch. If you don’t seal them, deadly carbon monoxide (CO) from your exhaust can get into your vehicle, as well as dirt and water. • The bumpers on your vehicle are not intended for hitches. Do not attach rental hitches or other bumper-type hitches to them. Use only a framemounted hitch that does not attach to the bumper. • KIA trailer hitch accessory is available at an authorized KIA dealer. You should always attach chains between your vehicle and your trailer. Cross the safety chains under the tongue of the trailer so that the tongue will not drop to the road if it becomes separated from the hitch. Instructions about safety chains may be provided by the hitch manufacturer or by the trailer manufacturer. Follow the manufacturer’s recommendation for attaching safety chains. Always leave just enough slack so you can turn with your trailer. And, never allow safety chains to drag on the ground. If your trailer is equipped with a braking system, make sure it conforms to your country’s regulations and that it is properly installed and operating correctly. If your trailer weight exceeds the maximum allowed weight without trailer brakes, then the trailer will also require its own brakes as well. Be sure to read and follow the instructions for the trailer brakes so you’ll be able to install, adjust and maintain them properly. • Don’t tap into or modify your vehicle's brake system. WARNING - Trailer brakes Do not use a trailer with its own brakes unless you are absolutely certain that you have properly set up the brake system. This is not a task for amateurs. Use an experienced, competent trailer shop for this work. Driving with a trailer Towing a trailer requires a certain amount of experience. Before setting out for the open road, you must get to know your trailer. Acquaint yourself with the feel of handling and braking with the added weight of the trailer. And always keep in mind that the vehicle you are driving is now a good deal longer and not nearly so responsive as your vehicle is by itself. You’ll need more passing distance up ahead when you’re towing a trailer. And, because of the increased vehicle length, you’ll need to go much farther beyond the passed vehicle before you can return to your lane. Due to the added load to the engine when going uphill the vehicle may also take longer to pass than it would on flat ground. Hold the bottom of the steering wheel with one hand. Then, to move the trailer to the left, just move your hand to the left. To move the trailer to the right, move your hand to the right. Always back up slowly and, if possible, have someone guide you. When you’re turning with a trailer, make wider turns than normal. Do this so your trailer won’t strike soft shoulders, curbs, road signs, trees, or other objects near the edge of the road. Avoid jerky or sudden maneuvers. Signal well in advance before turning or lane changes. Turn signals when towing a trailer When you tow a trailer, your vehicle has to have a different turn signal flasher and extra wiring. The green arrows on your instrument panel will flash whenever you signal a turn or lane change. Properly connected, the trailer lights will also flash to alert other drivers you’re about to turn, change lanes, or stop. When towing a trailer, the green arrows on your instrument panel will flash for turns even if the bulbs on the trailer are burned out. Thus, you may think drivers behind you are seeing your signals when, in fact, they are not. It’s important to check occasionally to be sure the trailer bulbs are still working. You must also check the lights every time you disconnect and then reconnect the wires. Do not connect a trailer lighting system directly to your vehicle’s lighting system. Use only an approved trailer wiring harness. An authorized KIA dealer can assist you in installing the wiring harness. Failure to use an approved trailer wiring harness could result in damage to the vehicle electrical system and/or personal injury. On a long uphill grade, shift down and reduce your speed to around 70 km/h (45 mph) to reduce the possibility of engine and transaxle overheating. • When towing a trailer on steep grades (in excess of 6%) pay close attention to the engine coolant temperature gauge to ensure the engine does not overheat. dial towards “H” (HOT), pull over and stop as soon as it is safe to do so, and allow the engine to idle until it cools down. You may proceed once the engine has cooled sufficiently. Generally, if you have a trailer attached to your vehicle, you should not park your vehicle on a hill. People can be seriously or fatally injured, and both your vehicle and the trailer can be damaged if they unexpectedly roll down hill. Parking your vehicle on a hill with a trailer attached could cause serious injury or death, should the trailer break loose or brake stops working. However, if you ever have to park your trailer on a hill, here's how to do it: 1. Pull the vehicle into the parking space. Turn the steering wheel in the direction of the curb (right if headed down hill, left if headed up hill). 2. If the vehicle has a manual transaxle, place the car in neutral. If the vehicle has an automatic transaxle, place the car in P (Park). 3. Set the parking brake and shut off the vehicle. 4. Place chocks under the trailer wheels on the down hill side of the wheels. 5. Start the vehicle, hold the brakes, shift to neutral, release the parking brake and slowly release the brakes until the trailer chocks absorb the load. 6. Reapply the brakes, reapply the parking brake and shift the vehicle to R (Reverse) for manual transaxle or P (Park) for automatic transaxle. 7. Shut off the vehicle and release the vehicle brakes but leave the parking brake set. WARNING - Parking brake It can be dangerous to get out of your vehicle if the parking brake is not firmly set. Maintenance when trailer towing Your vehicle will need service more often when you regularly pull a trailer. Important items to pay particular attention to include engine oil, automatic transaxle fluid, axle lubricant and cooling system fluid. Brake condition is another important item to frequently check. Each item is covered in this manual, and the Index will help you find them quickly. If you’re trailering, it’s a good idea to review these sections before you start your trip. Don’t forget to also maintain your trailer and hitch. Follow the maintenance schedule that accompanied your trailer and check it periodically. Preferably, conduct the check at the start of each day’s driving. Most importantly, all hitch nuts and bolts should be tight. • Due to higher load during trailer usage, overheating might occur in hot days or during uphill driving. If the coolant gauge indicates over-heating, switch off the A/C and stop the vehicle in a safe area to cool down the engine. • When towing check transaxle fluid more frequently. If you do decide to pull a trailer Here are some important points if you decide to pull a trailer: • Consider using a sway control.You can ask a hitch dealer about sway control. • Do not do any towing with your car during its first 2,000 km (1,200 miles) in order to allow the engine to properly break in. Failure to heed this caution may result in serious engine or transaxle damage. • When towing a trailer, be sure to consult an authorized KIA dealer for further information on additional requirements such as a towing kit, etc. • Always drive your vehicle at a moderate speed (less than 100 km/h (60 mph)). • On a long uphill grade, do not exceed 70 km/h (45 mph) or the posted towing speed limit, whichever is lower. Weight of the trailer What is the maximum safe weight of a trailer? It should never weigh more than the maximum trailer weight with trailer brakes. But even that can be too heavy. It depends on how you plan to use your trailer. For example, speed, altitude, road grades, outside temperature and how often your vehicle is used to pull a trailer are all important. The ideal trailer weight can also depend on any special equipment that you have on your vehicle. Weight of the trailer tongue The tongue load of any trailer is an important weight to measure because it affects the total gross vehicle weight (GVW) of your vehicle. This weight includes the curb weight of the vehicle, any cargo you may carry in it, and the people who will be riding in the vehicle. And if you will tow a trailer, you must add the tongue load to the GVW because your vehicle will also be carrying that weight. The trailer tongue should weigh a maximum of 10% of the total loaded trailer weight, within the limits of the maximum permissible trailer tongue load. After you've loaded your trailer, weigh the trailer and then the tongue, separately, to see if the weights are proper. If they aren’t, you may be able to correct them simply by moving some items around in the trailer. • Never load a trailer with more weight in the rear than in the front. The front should be loaded with approximately 60% of the total trailer load; the rear should be loaded with approximately 40% of the total trailer load. • Never exceed the maximum weight limits of the trailer or trailer towing equipment. Improper loading can result in damage to your vehicle and/or personal injury. Check weights and loading at a commercial scale or highway patrol office equipped with scales. • An improperly loaded trailer can cause loss of vehicle control.